Upon the edge of the world, beneath the eves of the Darkenfold forest, lie the Elkhorn Deeps. Here, where men eke out a living in the shadows of the forest, lies the small berg of Lead Hill. With stone walls and stout towers, Lead Hill is a sanctuary of sorts, where travelers may lower their guard and relax. Beyond those comforting walls are the wilds, and the Darkenfold is an unkind place, peopled by dark forces, fey, eldritch powers, and creatures though long dead, that continue to wander the earth. Of all the dangers the people of Lead Hill face, one most horrifying occurrence came to pass. Two children, too young to know the world, vanished from their home, carried off into the forest by unknown foul minded creatures. Faeries love to torment the lives of men through their suffering children, so few are surprised, though none know who did it, why, or how. They left few signs behind. Of late, a hag had haunted the area, pestering Lead Hill's mage and its citizens, but they drove her into the forests. Harpies dwell in the woods not far. Many have encountered the tree folk in the deeps. Other creatures abound and stalk the edge of wild, hunting for human prey. So none can say exactly what has happened to the children, though all want them returned. If that is no longer possible, all want those who lifted them caught and slain. Enter the Elkhorn Deeps to rescue the missing children! But be wary for things are not always as they seem and where allies and enemies work in tandem, great dangers often dwell. Above all, beware the lure of delusions. 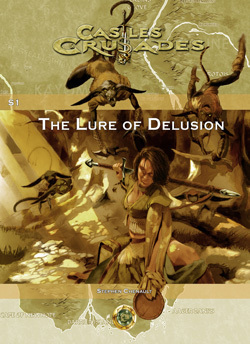 This adventure was play-tested in TLG's weekly C&C game and was written for the Castles & Crusades tournament adventure being run by John Wright and Eric Piper at GenCon 2009.